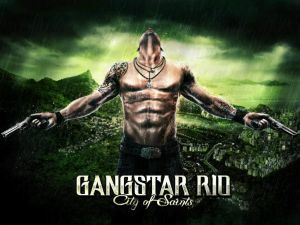 Gangstar Rio is the fifth game in the Ganstar series. Developed by Gameloft, it is one of the most fully-fleshed games on portable platforms, boasting over 60 missions and an experience that, at times, comes close to the triple-A status of Grand Theft Auto. This guide will aim to walk you through the game's extensive single-player campaign, as well as providing hints and tips for general gameplay along the way. The game is closest in terms of similarity to Grand Theft Auto, True Crime and Saints Row. It has a city-based sandbox, modelled on Rio de Janeiro in Brazil, heavily stylised and shrunk down, but still an impressive size for a handheld game. You can explore the entire city and its surroundings, including the sea, sky, and inside certain buildings. You are free to walk around and do what you like, but to level up (which unlocks new weapons, vehicles and perks), you'll need to complete missions, jobs, heists or races. All this and more will be discussed in detail in the rest of this guide. I cannot do the mission Hot Cocoa without injuring myself when trying to land my police helicopter on the soccer field!!! I have tried at least 5 times in a row. It won't let me pass the mission because it keeps killing my character!! Any help!? 27where is the meth lab???? ?